Regulators in China have finally issued the necessary paperwork that allows the Apple iPhone 4S to be sold in the country. According to MIC Gadget, earlier this week China's Ministry of Industry and Information Technology signed off on the necessary network access permit. 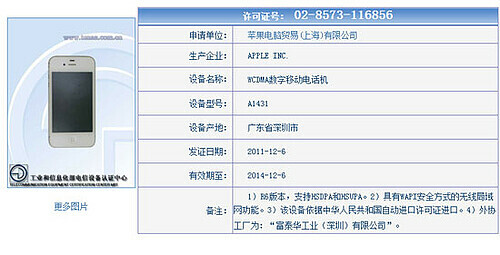 The Apple iPhone 4S has received a Radio Transmission Equipment Type Approval Certificate that will allow it to be sold in the country for three years. There should be no more obstacles in the way to prevent the phone from being launched during the Christmas and New Year's holidays. China Unicom says it will rollout the Apple iPhone 4S later this month after it already had finished preparations to offer the phone by November. The carrier will sell the 16GB model for 4,999 Yuan ($786 USD) off-contract. Analysts are waiting to see if they need to up their estimate of Apple iPhone 4S units sold in the current quarter. If the Apple iPhone 4S is launched in China before the end of December, the estimate of 28 million units sold predicted by JP Morgan analysts will certainly be raised considering that China has the largest population in the world. At the same time, the Apple iPhone is available at 7,000 locations in the country. China recently took over the title of the world's largest smartphone market from the U.S.and Apple CEO Tim Cook calls growth in the country "Amazing". With Apple the leading smartphone brand in China, a survey shows that the Chinese plan on buying the phone in numbers that are 4.5 times the device's current market share. The model that went through the testing by Chinese regulators is compatible with GSM, WCDMA, HSDPA / HSUPA, Bluetooth, and WAP. While China Unicom will be offering the Apple iPhone 4S, before the death of Steve Jobs, he was in the process of trying to get the Apple iPhone on to the lineup of the world's largest carrier, China Mobile. With more than 600 million subscribers, getting the Apple iPhone 4S in front of that large an audience would be big news, even for Apple. In September, the carrier was alleged to have received a positive reply from Apple on building an iPhone to run on the carrier's TD-LTE network, although nothing has been announced. A launch is expected in 2012. 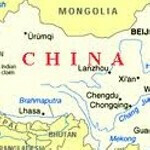 Currently, 8.5 million Chinese have an Apple iPhone on China Mobile's network, but must put up with 2G speeds.